The Human Fertilisation and Embryology Bill has cleared its Commons stages after a row about the lack of debate on reforming abortion laws. The bill, which allows experiments on hybrid human-animal embryos, passed despite a rebellion by 16 Labour MPs. Among them was Catholic MP Ruth Kelly, who quit the cabinet this month. MPs from all parties criticised ministers for excluding abortion from the debate and not allowing enough time to discuss other aspects of the bill. Health minister Dawn Primarolo said issues of "profound importance" such as embryo research had been addressed during the debate on the bill - which promises the biggest shake-up of embryology laws for nearly 20 years. After passing its third and final reading in the Commons by a large majority, the bill will now go the Lords. Earlier this year there had been speculation Ms Kelly might leave the government over her objections to the bill. In September she announced she was stepping down as transport secretary to spend more time with her family. Two other Catholic MPs - former defence secretary Des Browne, who also left the cabinet in this month's reshuffle, and Wales Secretary Paul Murphy voted in favour of the bill. The vote on Wednesday on issues including the growing of "hybrid embryos" for stem cells but some MPs were annoyed that no time was allowed to debate other issues. A timetable drawn up by ministers allowed only three and a half hours debate and put clauses related to abortion at the end of the list - time ran out before they were discussed. Critics said it had stopped debates on important issues to extend abortion rights to Northern Ireland and a measure which would have cut the number of doctors needed to approve an abortion from two to one. MPs were also unable to discuss the creation of "saviour siblings" - where an embryo is created to produce cells or organs for an older child suffering from disease. Labour MP Diane Abbott said the government's unwillingness to debate the extension of the 1967 Abortion Act, which legalised terminations under certain conditions, to Northern Ireland was "shabby". It would leave women there as "second-class citizens", she added. Tory spokesman Mark Simmonds said there was "real concern and anger" within Parliament that debate on key issues would be limited. And Lib Dem spokesman Norman Lamb urged the government to give a commitment to provide additional time for a separate debate on abortion laws. But Labour MP Sir Gerald Kaufman defended the government's approach, saying the bill was not primarily about abortion and it would be wrong to "pin" amendments onto it at this stage. The Democratic Unionist Party said the "sensitive" issue of abortion rights in Northern Ireland should ultimately be decided by the Northern Ireland Assembly, not the Westminster Parliament. DUP member Jeffrey Donaldson said all parties in Northern Ireland were united in this view and that, should the amendment be passed, it would cause "considerable problems for the political process". Abortion is illegal in Northern Ireland, apart from under exceptional medical circumstances, such as when the mother's health is at risk. It has been reported that ministers were reluctant to allow a vote on these issues given the strength of opposition in Northern Ireland. But the DUP denied it had done "any deal" with the government. The BBC has learned that the government may allow parliamentary debate time on abortion in two years' time, although Ms Primarolo said there were "no plans" to introduce a specific bill on the issue. The bill's third reading had been due in July but was delayed until the autumn amid claims that the government was worried about its political impact in the run-up to the Glasgow East by-election. 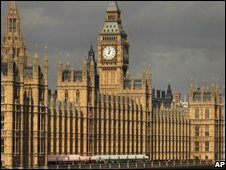 In May, the Commons rejected plans to lower the time limit for terminations, when Labour MPs were given a free vote on the issue. In Wednesday's debate, a number of MPs claimed measures in the bill would leave the door open to reproductive human cloning in the future. Tory MP Edward Leigh said confusion over such an important issue was "dangerous" but Ms Primarolo said there was a "clear prohibition" on the practice in the bill. She added that the bill would enable research to help tackle "dreadful and debilitating" genetic conditions within an "ethical framework". "I believe we have arrived at the right balance of controlling but not constraining scientific research," she said. The Conservative Party, which permitted its MPs a free vote on the bill, said it would keep the UK at the "forefront of medical innovation", while "protecting the special status of the embryo". The Lib Dems, which also offered a free vote, said it would advance scientific research while providing a secure ethical framework. What does research say about the survival rate of very premature babies? Should abortion law be changed?